The wedding date has come and gone. There are no more surprises to spoil. It’s only fair, then, that I finally share the results of my wedding dress drama. 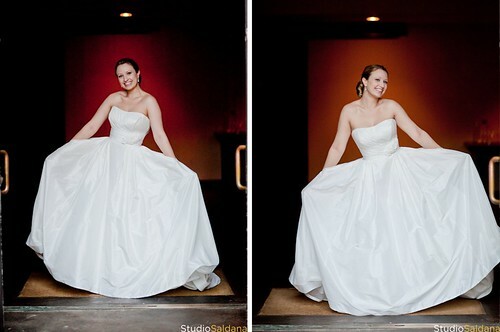 When I set out to plan the wedding, I most definitely did not envision myself walking down the aisle in a ball gown. I wasn’t particularly interested in anything whiter than ivory. And if you had said the words “taffeta” or “floral detail” to me I’d have raised an eyebrow at you before snorting in obvious disapproval. I somehow wound up in a diamond white, silk taffeta ball gown adorned at the waist with little rosettes that were inset with crystals and pearls. 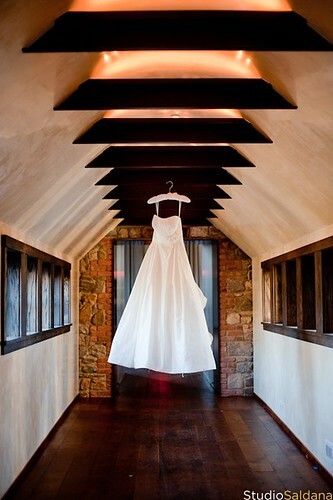 But I loved it–so much–and it definitely made me feel like a bride. It surprisingly wound up being a lot of fun to carry my big, white dress everywhere, and, looking at the pictures now, I can’t imagine having worn anything else. Oh, and let’s not forget the best part of all: pockets!